Millet is a grain that has been cultivated in East Asia for about 10 000 years. It is widely grown all over the world for both human and animal consumption. There are about ten different varieties of millet, some of which are also called sorghum. Millet has no gluten and so is ideal for coeliacs (those with gluten allergies), is high in protein so is ideal for vegegarians and vegans, and is "alkalising" which means it balances the acidity of diet that is low in fruit and vegetables and high in simple carbohydrates and meat protein. "The millet grown in India is still of an ancient variety. It has not been GMO'd or hybidised to the extent that the millet grown in, say, China or the USA has been. As a result it is more nutritionally dense and easier to digest than American or Chinese millet. It's like a wonder food: balancing, cleansing, full of vitamins and minerals, and easy to digest - we should all be eating more millet." Kristina was kind enough to give me some samples of their millet flour to use in the bakery. As millet does not have gluten, you need to be content either with flat bread or pancakes (in the bread department) or to raise it with baking powder and/or bicarbonate of soda or combine it with a glutinous flour to add flavour, texture and nutrients. Don't expect millet to rise on its own. No matter how much yeast you add, it will not rise so don't waste it in trying. Proof the yeast in the usual way and add in the flours. Pour in the water and begin to knead. It's a sticky job because the millet does not stretch out like wheat flour and it absorbs a huge amount of water. Knead for 15 minutes or so and then let rest 1 hour. Shape and let rest 45 minutes. Bake at 200 C for 45 minutes. I thought I would make one big loaf and I ended up making two. For the spectacular recipe I thought I would dial down the flour flavour to enable the millet to shine through. I also thought about how I had cooked millet before: dry fried and then boiled and added to a salad; dry fried and then boiled and eaten as a salad (kind of like tabouli); made into porridge with butter and honey and cinnamon and raisins...I did this to think about how I might gussie up the bread and make it super tasty. I decided on adding grated nutmeg and honey to the dough and making it a sourdough to add an acidity to bring out the millet flavour as well. The virdict (three people tried it, one of whom was my armenian taxi driver - don't ask): sensational. Your qty of water is extremely excessive for all but the brand of millet that you were using. I tried Bob's millet and that qty of water just turned everything into a liquid mess. Hi there, I am sorry this did not work for you. I was using millet flour, not millet. Maybe this explains the problem? Let us know! Hi! Do you think that this recipe would work with white flour instead of whole meal flour? Thanks! Hello!! I used pearl millet flour(10%) with white flour to make yeast leavened bread & it came with acceptable volume & good taste. Want to know did u used more than 10% for the same..?? Hello, that is a great question....I think I probably did. I also "scald" my millet flour by pouring boiling water over it to make a thick THICK paste and then let it cool and add it to the dough. I think for one kilo of flour I add about 300 g of scalded millet flour. But if you look here: http://www.virtuousbread.com/bread-and-conversation/what-is-scalded-flour-and-why-use-scalded-flour/ and here: http://www.virtuousbread.com/bread-and-conversation/baking-bread-with-millet/ you will see some ideas both about scalding and a recipe for wheat and millet flour that uses much more millet! hi i would like to get a very easy yeast free and gluten free bread recipe with millet flour only.thanks. Hi there, a pure millet BREAD is impossible to achieve because millet has no gluten. The best you can do is make pancakes and substitute a milk substitute for the normal milk that you would otherwise put in. If you stick in some eggs you can enrich it and add some cinnamon and melted coconut oil and they will be delicious! Thanks for your helpful pointers. 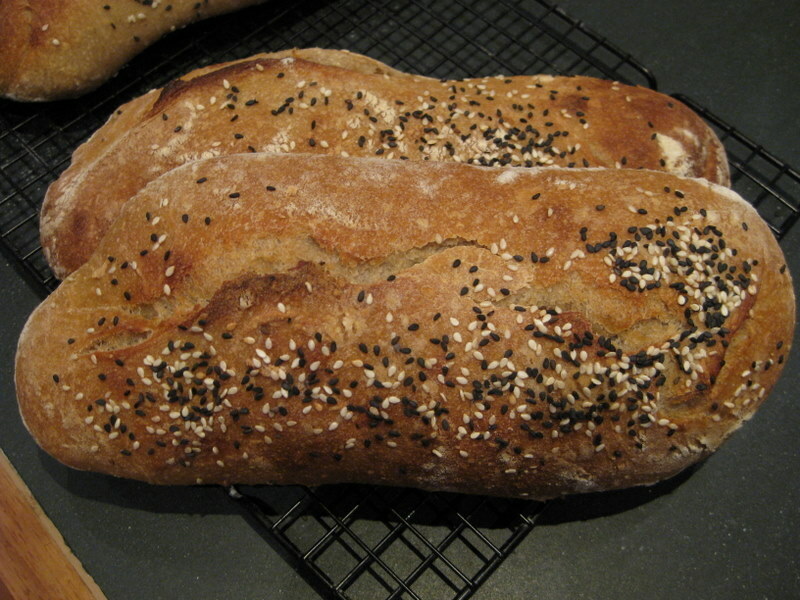 I tried this recipe and added several different kinds of seeds and it made a delicious loaf! My only complaint is that it didn't rise as much as I would have liked. Do you have any tips to get more volume? What about adding some vital wheat gluten? because it works for me. It is a very soft dough indeed and of course you can reduce the amount of water as you wish to get a dough with which you are more comfortable. Kind regards. It depends on what kind of diet you are following. I suggest you do some research on millet to see if it suits your objectives. You can use xanthene gum but we don't recommend it. Sadly we are not experts in gluten free bread. However, there are many experts around - if you do some research you will find them. Is it possible to get a simple millet bread recipe for my bread machine? Gluten and dairy are fine for me and in fact welcomed for their nutrition. The posts are all so interesting but I'm a recipe person and need to follow steps, working mother with no time for experimenting. I dont have a recipe for 100% millet bread, sadly. We are committed to gluten here....However why not google millet flour bread machine recipes? I am sure you will find something great. Good luck! Thx. Can't find any. That's why I searched in blogs. The very few I found have all these odd ingredients and are for gluten free people, diabetics or vegans. I just want some bread recipes for the machine that add some extra nutrition and I heard millet is good for you. I also tried and it's way too much water (and I didn't even use as much as specified) for my millet flour. It is indeed a liquid mess. 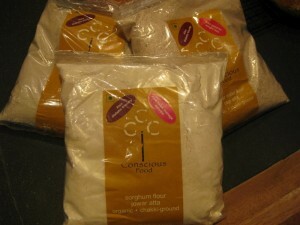 I'll try to fix this mess now as these organic flours are not cheap. Without a photo, it's hard for me to judge. This dough is very wet - like a ciabatta dough - and it's hard to handle. However, have confidence! The bread is lovely. Hi, Thank you for the great idea to use millet flour!! I used in in place of normal flour in my regular "whole loaf" and it worked a treat. I also tried your recipe and yes there is plenty of liquid, I found that mixing the dough for about 2 minitues and then leaving it to sit helpts to produce a sort of wetter dough than regular but once cooked it was lovey, hope this helps anyone!! Great! I am so glad you like it. I LOVE it. it is a very wet dough (I tend to prefer wet doughs) and I am glad you tried it out. You can always cut back on the water next time. I guess I should have read the comments first... silly mistake. I, too, tried to bake the "Good bread with millet flour added" and ended up having to throw it away as no amount of baking could result in anything comparable to a bread. It ended up burnt on the outside and a still liquid mess on the inside. What a waste. And yes, I did use millet flour, not just millet. I am sorry you found this dough too soft to work with. It is not an easy dough. If you ever find a dough is too soft, just add more flour until you can work with it. Wet dough is not simple!